Glasgow-based GRAHAM apprentice Shams Rahimi has expressed his “pride” after scooping two coveted awards at the Construction Industry Training Board Awards. Shams won the CITB ‘Scotland Apprentice of the Year Award’ and the ‘Scotland South Apprentice of the Year Award’ at a glittering ceremony in London on November 1. The trainee engineer held off stiff competition for the respective national and regional awards, which seek to recognise apprentices from all trades across Scotland, England and Wales and showcase their achievements while gaining qualifications. Commenting on his success, Shams said: “I’m still in shock to have won both of these high-profile awards. The calibre of the other nominees was exceptional so to win both of these awards is a source of immense pride for me. I was just grateful to be nominated so I cannot quite believe it. 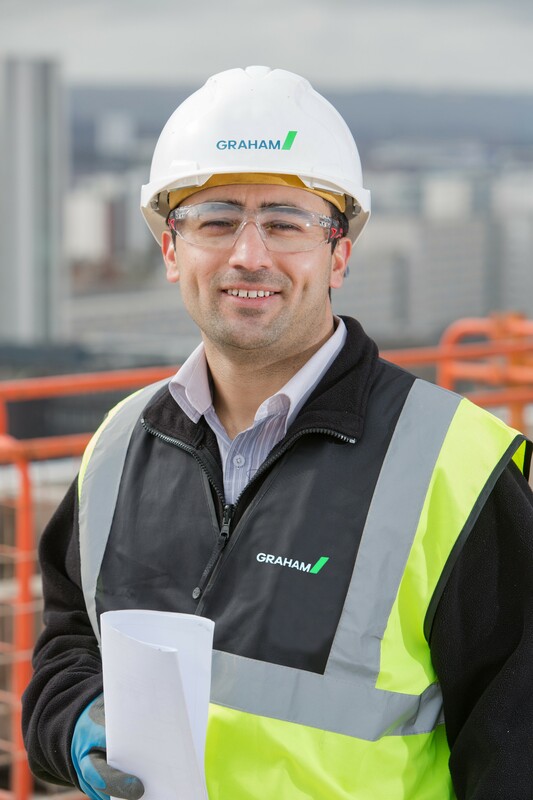 Captivated by a documentary on the construction industry, Shams demonstrated his initiative and determination by walking from his accommodation to a GRAHAM site in Glasgow city centre before waiting patiently to see the construction director and request an interview. Having never been employed before, he relied on a CV made up of personal information rather than a job history and immediately impressed GRAHAM’s management with his enthusiasm to learn. Subsequently, he was awarded a part-time role, coinciding with his first year at college, before being offered a technical apprenticeship. He is now studying an Undergraduate Degree (Hons) in Civil Engineering at Heriot Watt University, through a Graduate Apprenticeship Scheme, and is currently working on GRAHAM’s Scotway House student accommodation project in Glasgow. GRAHAM regional managing director – building, Gary Holmes, was full of praise for Shams’ unique achievement. He said: “On behalf of everyone at GRAHAM, I want to pass on my congratulations to Shams. His journey is truly inspirational, and he fully deserves every accolade and the subsequent recognition that comes his way.